Alright, I suppose you've come here to learn how to waypoint and you felt like looking at yet another wypt. guide? Well, then you've come to the right place! More graphics will be added soon. Bunny Hop - When you cause a Bot to leap forward in the direction they are running. There, you now will be able to understand what I speak of in this guide. Are you an impatient person who won't feel like reading through this entire thing? Well good for you. Here's some tips. 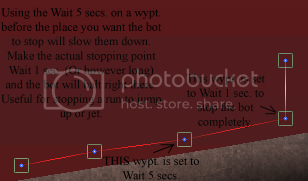 But the first and most important tip is: LEARN TO BE PATIENT IF YOU WANT TO WAYPOINT! If you want to make a bot jump over a hole/trench/etc. then you need to make them bunny hop right as they reach the edge, and they should clear any decent sized hole (Not Huge Ones.). Always be prepared to make BACKUP WAYPOINTS! If you haven't realized yet, you need to be patient and able to devote sometimes several hours to waypointing a map. You can't do much if you don't actually know HOW to waypoint a map. I will let you in on how to make a bot operate itself properly here. 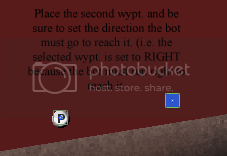 - First thing's first, pick the direction you want the bot to head to reach the waypoint by right-clicking. Now place the waypoint on the map. The first waypoint should probably be placed on a respawn, but you CAN start just about anywhere. - Now place the second waypoint, making sure to set the proper direction that the bot will have to go in order to reach it. (i.e. 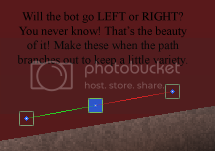 If the bot is going to come from the left, then select RIGHT, as that's the direction they have to go to reach it.) The second waypoint should be close enough to the first that the bot won't get lost along the way. - Now hold SHIFT and click the first waypoint. While still holding SHIFT, click the second waypoint. Congrats. You've learned how to connect two existing waypoints. - Now release SHIFT and you'll notice that the line/box are still there. You can quickly place multiple waypoints connecting to the next by clicking where you want them without holding SHIFT. This allows you to place long lines of waypoints going in one direction with haste. To stop placing waypoints that connect, simply hold SHIFT and click on thin air. - If you tell a bot to go UP it will jump. If it is running, then the best idea is to make it jump in the direction it's going, so combine UP with its direction. This is how you can make a bot clear a gap or make it Jimmy Skip. 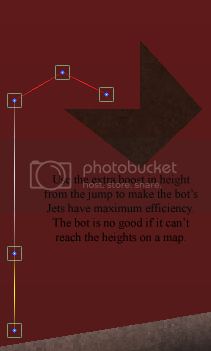 - Need a bot to get to a high area, but your restriction of Jets cuts it off just a bit short? 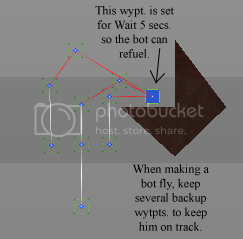 Try making the bot go UP from a standstill, and then make it fly from a waypoint in mid-air. This allows a bot to jump up and THEN jet, letting it soar to greater heights! - If a waypoint is set to FLY and LEFT/RIGHT, it will fly in that direction at an angle of about 45 degrees. Take this into account when making the bot fly long distances sideways. 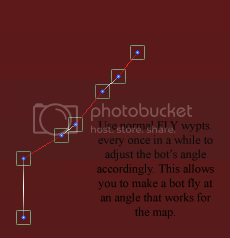 If you need the bot to go LEFT/RIGHT at a lower angle, simply place a normal FLY waypoint every few feet to straighten the bot's trajectory out. - If you have a harmful spot on the map such as barbwire (in TW maps), then you need the bot to JIMMY SKIP over the spot. - When you have deadly boundaries on a map that cause death upon touch, make several BACKUP WAYPOINTS as a safety net to get the bot away from them. - Does your bot fly aimlessly away from your waypoints until it's out of jet fuel? This usually happens due to sloppy flight waypoints, but sometimes it's only because the bot started the flight off wrong. To keep the bot from doing this, make some mid-air BACKUP WAYPOINTS that cause him to stop flying, so he doesn't fly away. - Does your bot run to a waypoint and suddenly stop or hop/run around senselessly instead of proceeding? Sometimes a poly will screw up a bot's waypointing and this usually causes this glitch. Check all of the nearby polys and fix any that may be jutting out/incomplete. 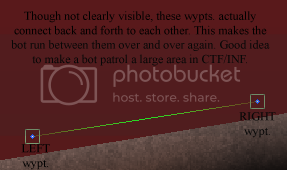 If this doesn't fix this, scrap that section of waypoints and try again, possibly setting multiple waypoints closer together so that the bot always knows where it's supposed to go. - Now you need to learn real quick about Paths. If you are making any map that isn't involved with a flag, then Path 1 and Path 2 are simply two different ways a bot can choose to go. In Pointmatch a bot will follow Path 2 if they have the flag (At least I think. I'll test this next time I make a Pointmatch... haven't made one in a couple years.). In CTF/INF, Path 1 is reserved for Alpha, while Path 2 is for Bravo. However, if a bot captures the enemy flag, they will use the other team's waypoints to get back to their base. (More on this in the CTF/INF section.) For HTF matches, Path 1 is used for Alpha, while Path 2 is for Bravo, but they do NOT change paths after getting the flag. - BE VERY CAREFUL OF THE PATH 1 - 2 BUG! If you have one or more waypoints selected and you switch to the other path, the wypts. you have selected will change path types as well. This can easily screw up maps. - Oh, and this is kind of important... 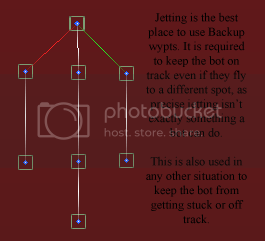 If you make a waypoint connect to MULTIPLE others, then the bot will randomly choose which way to go. These are waypoints on Deathmatch/Pointmatch/Rambo Match maps that the bots use to roam around until they encounter an enemy. Depending on the type of map, there are several ways for these to be tackled. DEATHMATCH/TEAM DEATHMATCH - Simply make your bot run around the map in a simple fashion, making sure to include waypoints to ALL areas, allowing them to scour the entire map for opponents. If you don't include the entire map, then it's too easy for them to end up lost and useless. POINTMATCH - After waypointing a bot's way to the flag, you need to use Path 2 (Unless that's changed for some odd reason... Haven't made a pointmatch map for a while...) to make them run all around the map in a Deathmatch fashion. However, it's best to keep them close to the origin of the flag, as all other bots will head to that point after a while. RAMBO MATCH - Get the bot to head to the bow, then you still use the same waypoint path for the rest of their movement. Make them go across the map and scour for opponents, and make sure that other bots are waypointed to encounter the bow's wielder (i.e. Make waypoints that will cross with the direction the wielder is heading.). These waypoints are simply to occupy the bot and let them move smoothly about the map until they meet an enemy. These usually offer some of the most satisfaction upon completion, as having a bot being able to smoothly traverse a map is a great achievement. Okay, here's where the waypointing is in some SERIOUS need of fine-tuning. You cannot have a failure of a waypoint on this map, or the matches will come to a standstill. Make a Path 1 waypoint leading to Bravo's base. Once it gets to the enemy's base, it is highly reccomended to make several BACKUP WAYPOINTS ensuring that the bot doesn't skitter away from the flag. Do the same for Path 2 leading from Bravo's base to Alpha's. Here's the catch: Once a bot gets the flag, they revert to their enemy's Waypoints to get back to their base. Big deal, right? You should already have a working waypoint path for the other team. However, if a bot is running along and runs into a Stat. Gun, it will STOP. This is NOT good for the flag carrier to do, so be sure to either a.) Keep Stat. Guns out of the way or b.) make a waypoint on the Stat. Gun to keep them moving (Though this will prevent the actual team's bots from using the gun.). Here you use Path 1 to control Alpha's movement, and Path 2 for Bravo's, only there is no path switching after the flag is captured. What does this mean to you? Well, now you need to make a full roam waypoint for the bots that leads them into the flag. You can also make 'HIDING' waypoints, where a bot runs to a secure location to hide after getting the flag. Well, this section is kind of awkwardly titled, as I only really have one last tip for you. When you are preparing to waypoint a map, I reccomend that you put aside several hours of time for the job. It can take a long time, sometimes even too long for one sitting, to make a good waypointed map. This job requires a LOT of trial-and-error and tiny adjustments, so make sure you're patient enough for the job. If you REALLY want to make good maps but don't want to devote time to waypointing, then I suggest you either find someone to waypoint it for you, or you just don't make maps with Bot accessibility. Whats that? Did I hear... Sticky? This is a nice tutorial. I will be wayponting a map soon, and this guide will definitely help me. Worth reading. Glad to know it helped, though. Its the same thing with me. Im working on Version 3.0 (1.0 and 2.0 both released 2 days ago ) and i cant wait to start the waypointing proccess . I found one problem in the guide. I didn't read it all...so excuse me if I error in this. Towards the top, in the Lingo section. In the Jet-stop section, this isn't required as bots do this automatically. I have observed this through many a waypointing trials. Also, just a small tip, but you ought to change the red background in the graphics. Dark red+black text makes the tips rather hard to read. Nice little tutorial for starters, although I still prefer Keron Cysts . This would be handy if the reader wanted to skim something rather quickly to get a few basics down. Keron's is mainly for more detail and advanced waypointing although he does have the basics spelled out as well. Well, i waypointed my first map and they seem to do fine, thanks to this guide, i also tested 12 bots instead of 1. I too have noticed they jet-stopped by themselves. Sorry for the Jet-Stop error. I've never NOT put a spot for them to stop, so I didn't know. Nice tutorial, it help me out. It looks like you have the basics down The centered text is extremely annoying to follow, tho'. 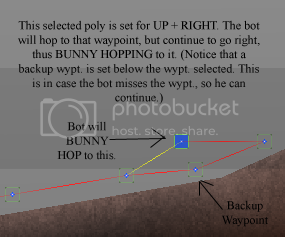 You should never need a backup waypoint for such a simple ability as a bunny hop; just make sure the Up + Left/Right wypt. is close to the first enough so that it is impossible to miss. That doesn't make sense. If you don't have Bravo heading towards the white flag, Alpha will never score. Just keep Bravo from camping around the white flag by setting Stop & Camp waypoints (or a lot of Wait functions) on the way, like inf_Abel. Lastly, the HTF section is slightly incorrect; definitely you want the teams to be able to move throughout the entire map using one path, as if they were DM, but the flag-carrier swaps to the other Path—just a trivial note that can play a heavy role in bot distribution throughout a map (for example, try flipping htf_Baire's waypoints so Path 1 is Path 2 and vice-versa; all of the bots will flock to the bottom of the map where they intersect and leave the top areas boring and empty). FINALLY! I KNOW HOW TO WAYPOINT! After 3 years, I'm back on the forums! Page created in 0.611 seconds with 19 queries.